Ryan Giggs hailed the blend of youth and experience that helped Wales earn a 1-0 win over Slovakia in the opening game of their European 2020 qualifier. 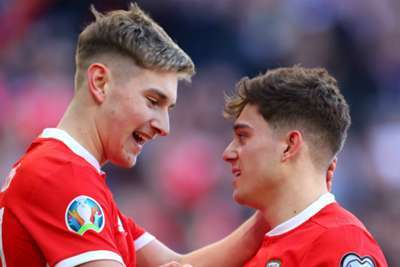 Daniel James' goal after five minutes at Cardiff City Stadium proved to be decisive and the 21-year-old winger was the stand-out player throughout an afternoon on which Wales were worthy winners against Pavel Hapal's men. While Gareth Bale was a closely marked man, James thrived on the space afforded to him and fellow youngsters David Brooks and Harry Wilson, who were also impressive. Giggs was satisfied after seeing his faith in his young players repaid, while the likes of Bale, Joe Allen and substitute Ashley Williams helped were on hand to add a little extra know-how. "There were so many outstanding performances and we dug in at the end to get that clean sheet," Giggs told Sky Sports. "In the first half we showed real composure. We rode our luck a little bit in the second half and I thought we could have scored a few more in the first but some of the play was fantastic, paired with great determination.